Don’t let the cold fool you. Better still, don’t let everyone around you fool you. You will be called crazy, repeatedly. Here’s what I wore cycling to and from work today with a high of 34 degrees. Same thing I would wear any other day. 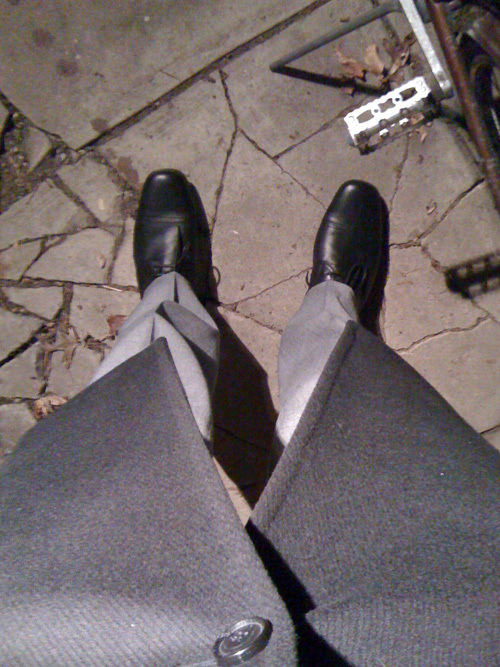 No special shoes; no pants tucked into my socks; a three-quarter length overcoat. It’s that easy. It’s even easier if the roads are clear. Maybe you have to go a little slower and watch for ice patches, but you get the added benefit of the cold flattening your hills because you won’t sweat nearly as much, if at all. I’m a warm person, so I never need to dress differently than I would any other day. You may need a thicker sweater. Or long underwear. But nothing you can’t wear through a work day or take off if you get too hot indoors. It’s not Olympic alpine skiing. It’s just riding a bike in the cold. I tried this two winters ago. Not a half-hearted try, either; with no car, giving up on biking meant I had to walk. But living in small-town Wisconsin, where the snow ‘clearing’ meant the already-not-bike-lane-d roads in my town shrunk, ice wasn’t in patches but sheets, and drivers were not forgiving (nor did *they* slow down on the iciness), even snow tires and my winter coat didn’t cut it. Also, high of 34 and high of -4 are different beasts. But I cycled until I just couldn’t, anymore. And yes, I was notified of my craziness multiple times. Your advice might be fine for someone who lives in California or western Oregon. However, I used to live in St. Paul, Minnesota, where winter biking was a serious challenge. The city did a decent job of clearing the roads after a snowstorm, but on narrow streets that were already lined with parked cars, the streets became even narrower as snowbanks piled up on the curb. Drivers seldom want to share the road with a cyclist even in the best of weather, but on a day when traveling conditions were hard for everyone, they REALLY didn’t want to slow down or brake for a struggling cyclist on an icy road. Also, as Melanie Killingsworth points out, we don’t get patches of ice in the Upper Midwest: we get whole streets sheeted over in slick, hard ice. Not even spiked winter tires will help you on that stuff: you have to be a skilled cyclist with a lot of guts to want to ride in conditions like that. Also, no amount of “special gear” will insulate you against subzero windchills. A couple of years ago I took a neighbor into the ER for severe frostbite on his face after he attempted to bike to work in a windchill of just 5 degrees below zero. When I asked him why he had tried such a thing, he said the roads were finally clear and dry, perfect for biking. I live in New England. We’ve had some pretty famous winters over the years and it’s still possible to cycle through them—but it doesn’t have to be an all-or-nothing proposition. Nobody loses credibility for not riding every day. I drive to work occaisionally. I drive in the summer when the heat is too oppressive. Certainly the most severe conditions—negative temperatures, sheets of ice—aren’t any place most would take their bikes, myself included. If cycling is ever stressful, then the whole point is being missed. But during a season with infrequent snows, even a particularly cold one, I’ve found there’s a lot of days when cycling is perfectly lovely. Most of the days, in fact. And I like to ride then. How do you stay warm, yet not sweat? How do your fingers not turn to clumps of ice frozen to the bar? How do you not get covered in icy, dirty spray from passing cars? How do you keep your nose from dripping down your chin? How do you arrive and still be respectable looking? I have a simple enough commute to school. Less than 4 miles with two kids in back. (which translates to 16 miles a day) And it isn’t working without taking the entire morning and a need to shower when all is said and done. Plus I’m grumpy. You’ve got me wondering what I’m doing wrong! You’d be surprised how far riding just a little more slowly will get you with this kind of thing. It keeps you cooler in the summer and more comfortable in the winter when you’re dressed warmly. Just a little less effort and you’ll find you can make it up a long, gradually sloping hill with noticably less sweat than before. Avoiding spray is something of an art. Really knowing the roads on my commute is how I do it. I always know where to be on the road to be in the best position away from the car traffic. This is my first year cycling through the winter – it’s going well so far. It’s easy to do comfortably, now that I wear a full face motorcycle helmet along with sensible layers and excellent winter gloves. 12 deg f has been the coldest so far, but the helmet will eliminate all chance of frost bite. Overheating is a greater risk. Summer riding – back to shorts, tee shirt, and cycling helmet. Winter cycling is indeed the same as cycling! It’s a pleasure like no other, and if I dress for the weather of the day, I’m perfectly comfortable.